Residents of KwaMashu in Durban, KwaZuluNatal witnessed a jaw-dropping spectacle on Wednesday as maggots dropped continuously from the private parts of a woman who was identified as Zodwa. The scene turned chaotic as residents trooped out to see the woman sitting in a car with the assistance of family members and sympathisers. It was suspected that she might have been a victim of agent of money-making ritual as her condition allegedly defied orthodox medication. According to reports, the woman was also brought to one of the men she was associated with, a carpenter in the community. Of the reason for bringing the afflicted woman to the man, a source at the scene who asked not to be named, said: “The woman was brought to the carpenter who was her former husband. Her family members believed that the man may be responsible for her worsening condition that defied treatment in hospital where she was admitted for months. Another source, who did not want her name in print, said: “The woman had dated different men in the past and it is believed she may have been ‘used’ going by what we heard from those who know her. It was learnt that the carpenter, whose real name could not be ascertained at press time, made remarks that suggested the woman was being punished for her promiscuity, after which the woman’s family members decided to bring her to him for possible solution to her predicament. The man reportedly fled before the arrival of correspondents. 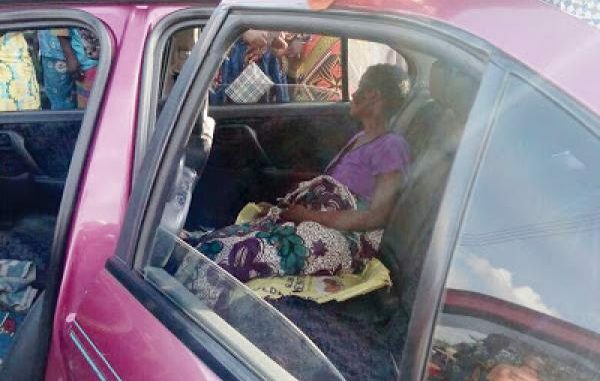 At the scene, sympathisers helped spread a sack on the car seat on which the woman sat when the maggots continued to drop even as a stench emanating from her body fouled the air. “This is what my beauty has done to me o,” the woman cried before being taken away by her family.